It is true that choosing your setting is the hardest part of getting your engagement ring, it is also true that deciding on your metal can be challenging which is why we have decided to do this week’s blog all about Platinum. Platinum is the more expensive options for a metal for an engagement ring but there are many reasons for this in terms of its quality and durability. Although it looks quite similar to white gold, the metals do in fact differ in many ways. The first thing to keep in mind about platinum is that it is rare. Platinum is actually 30 times rarer than gold which makes it less common and therefore the more unique option. In terms of durability and wear and tear, platinum is exceptionally durable. This metal ages well and requires much less maintenance than a white gold ring (which would require regular rhodium plating) The brilliance of the metal can simple be maintained by using soap and warm water along with a soft brush. You can also get it polished professionally. The colour of the metal will also remain constant and will not begin to fade away but it may dull slightly. For comparison, with a white gold ring, the re-plating is required as the yellow gold that is used as a part of its alloy begins to come through. This is not a problem with platinum as the metal is more pure and usually consists of 95% platinum and 5% other metals. Furthermore, platinum is more resistant to scratches and will also keep your diamonds more secure as the metal as a whole is stronger. So, although platinum comes with a heavier price tag, it brings along many benefits with it such as increased durability and less maintenance. On a perhaps less important note for many but very important for some, platinum is ideal for those who may have allergies to many precious metals as Platinum is hypoallergenic. 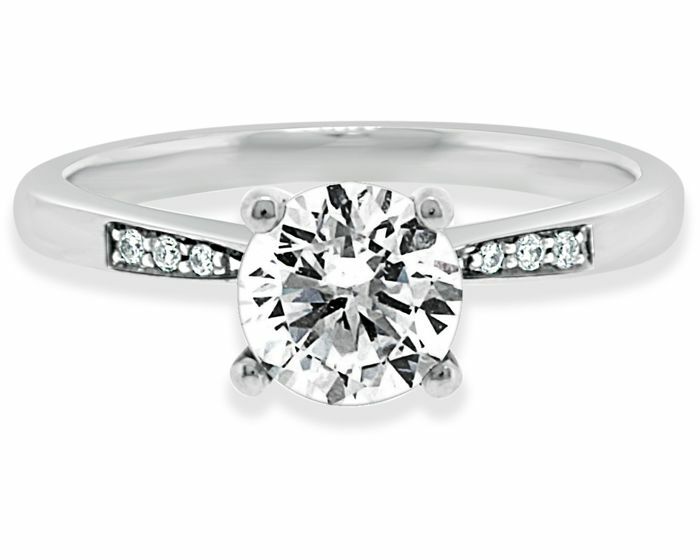 On a more romantic note, Platinum is a symbol of everlasting love, purity and strength, which all sounds good to me! Gold is still a very good option for your engagement ring and has been for decades. Therefore, in the end, it comes down to whatever metal you prefer visually and what qualities you value in your metal.